Corporate anti-corruption initiatives can make a substantial contribution towards curtailing corruption and advancing efforts to achieve the United Nations’ Sustainable Development Goals. However, researchers have observed that underdeveloped assumptions with respect to the conceptualization of corruption and how firms respond to corruption risk impeding the efficacy of anti-corruption programs. We investigate the relationship between the perceived level of corruption in foreign host countries and the organizational structure of subsidiary operations established by multinational corporations (MNCs). Foreign host market corruption is disaggregated into two components—private and public corruption. We employ an uncertainty-based perspective grounded in transaction cost theory to focus upon the distinct mechanisms through which private and public corruption can each be expected to impact a foreign subsidiary’s organizational structure [wholly-owned subsidiary (WOS) or a joint venture (JV) with a local partner]. We expect that each type of corruption fosters a different type of uncertainty (environmental or behavioral) which predominates in shaping the MNC’s choice of foreign subsidiary investment structure. Hypotheses are developed and tested with a sample of 187 entries into 19 foreign host markets. Each type of corruption was found to exert a distinct effect upon the organizational structure of foreign subsidiaries. More precisely, while heightened perceived levels of public corruption were found to motivate MNCs to invest through a JV with a local partner rather than a WOS, more pronounced private corruption precipitated the opposite outcome. Corruption is a relentless grand global challenge that has been implicated as the root cause of numerous social and economic maladies (Argandoña 2007). The Sustainable Development Goals (SDG) agenda developed by the United Nations (UN) is comprised of 17 goals that have been designed to protect the planet and improve the living conditions of its inhabitants (Voegtlin and Scherer 2017). One of these goals (SDG 16) targets to “substantially reduce corruption and bribery in all their forms” (United Nations 2015). The gravity of this imperative is undeniable given the recent sobering observation that more than 80% of the world’s population lives in a country with “a serious corruption problem” (Transparency International 2016). Scholars have concluded that corruption has become one of the world’s most pressing challenges, affecting “environmental protection efforts, human rights, national security, access to healthcare and justice services, economic development and the legitimacy of governments around the world” (Feathers 2014, p. 287). In fact, researchers and policy makers have observed that corruption is particularly harmful to humans and society because it threatens to undermine progress with respect to several other pressing SDGs that have been developed to reduce inequality and improve living standards (Trapnell et al. 2017). As examples, the SDGs adopted by the UN include goals pertaining to the alleviation of poverty (SDG 1), enhancing health and well-being (SDG 3), improving education (SDG 4), and ensuring access to clean water and sanitation (SDG 6). However, scholars have found that corruption adversely impacts health and well-being by limiting access to public health clinics, reducing immunization rates and delaying the vaccination of newborns (Azfar and Gurgur 2008). Further, countries characterized by widespread corruption have experienced lower levels of educational attainment and a lower likelihood that their citizens will escape the poverty trap (Eicher et al. 2009). Researchers have also found a statistically significant negative relationship between the level of corruption in a country and access to both adequate drinking water and sanitation (Anbarci et al. 2009). Consequently, reducing corruption has become an important component of the sustainable development agenda (Trapnell et al. 2017). In elaborating a role for management researchers in efforts to address the grand challenges highlighted by the UN’s SDGs, George et al. (2016) propose that scholars should focus on deepening our comprehension of stubborn societal problems. Building on this proposition, researchers have observed that corporate anti-corruption programs can play a central role in both combatting corruption (Argandoña 2017a) and attaining sustainable development because “anti-corruption efforts…underpin the achievement…of all other SDGs” (Trapnell et al. 2017, p. 36). However, assessments with respect to the efficacy of corporate anti-corruption codes and programs have been mixed. While some have suggested that they have shown some “ability to foster ethical behaviors” (Mercier and Deslandes 2017, p. 781), others have concluded that there is “no definitive evidence that codes have a significant effect on ethical behavior in organizations” (Painter-Morland 2010, p. 266). Heeks and Mathisen (2012) propose that the effectiveness of anti-corruption initiatives can be undermined by “design-reality gaps” whereby theoretical assumptions embedded within the design of anti-corruption programs fail to accurately reflect the reality of the contexts within which these initiatives are deployed. Two prominent sources of potential misalignment include a narrow conceptualization of corruption (Persson et al. 2013) and an underdeveloped comprehension of how firms respond to corruption (Hansen 2011). Consistent with this perspective, scholars have observed that two assumptions frequently underpin the strategic and policy prescriptions of anti-corruption theorists. First, corruption is conceptualized as occurring primarily within a multinational corporation’s (MNC’s) public sector transactions with government officials and bureaucrats (Goel et al. 2015). In this regard, legal scholars (Green 2013) and economists (Hodgson and Jiang 2007, p. 1043–1044) have observed that the prevailing conceptualization of corruption has constrained the scope of research inquiry “to the public sector, despite the fact that private sector corruption is often acknowledged.” Second, engaging a “middleperson” such as a joint venture (JV) partner is assumed to be a key strategy employed by MNCs to manage the uncertainty and transaction costs precipitated by more pronounced government corruption (Bray 2005; Drugov et al. 2014). Consequently, the efficacy of scholarly recommendations with respect to corporate anti-corruption programs risks being impeded by underdeveloped assumptions with respect to how corruption is conceptualized and how firms respond to corruption. To address these limitations, business ethics scholars have become more focused upon enhancing our understanding of the various types of corruption that firms encounter in foreign markets (Luiz and Stewart 2014; Van Vu et al. 2018), as well as the different strategic, structural and operational responses of MNCs to heightened levels of corruption (Godinez and Liu 2018; Orudzheva et al. 2018; Xie et al. 2018). In doing so, ethics scholarship (Clark and Brown 2015; Gago-Rodríguez et al. 2018; Hauser 2018; Remišová et al. 2018) is generating new research insights that are helping to inform the efforts of anti-corruption scholars who endeavor to design better strategies to curb MNC engagement in foreign market corruption. We build on this research tradition in the ethics literature in two important ways. First, we leverage the work of business ethicists’ who have advocated in favour of broadening the conceptualization of corruption and elaborating the nature and effects of different types of corruption, particularly private sector corruption and public sector corruption (Argandoña 2003, 2017b; Gopinath 2008). Second, we extend the work of ethics scholars who have theorized that corruption and the uncertainty that it precipitates may impact the organizational structure of foreign subsidiary investments (Godinez and Liu 2018; Luiz and Stewart 2014). In this regard, Montiel et al. (2012) have proposed that different manifestations of corruption may precipitate distinct uncertainties for firms and exert disparate impacts upon firm decision-making. As such, we ask: How do the perceived levels of public sector (government) corruption and private sector (non-government) corruption impact upon the organizational structure of a MNC’s foreign subsidiaries? We apply an uncertainty-based perspective (Sartor and Beamish 2018) to focus on the distinct mechanisms through which the two types of corruption can be expected to influence the structure of foreign subsidiary investments. When MNCs enter into foreign markets characterized by more pronounced host market corruption, we anticipate that public and private corruption will each exert distinct effects upon the organizational structure of their subsidiaries. This is because each type of corruption can be expected to foster different types of uncertainty and risk which predominate in shaping the MNC’s choice with respect to the structure of its foreign subsidiary (wholly-owned subsidiary (WOS) versus JV with a local partner). In the case of public corruption, we expect that environmental uncertainty and knowledge-based risk will be the primary uncertainty and risk influencing the MNC’s structural decision. Conversely, in the case of private corruption, behavioral uncertainty and opportunism-based risk will predominate in shaping the MNC’s preference. Hypotheses are developed pertaining to the impact of each type of corruption upon a MNC’s choice between a WOS and a JV with a local partner. We test these hypotheses and find that each type of corruption exerts a distinct impact upon the organizational structure of foreign subsidiary investments. More precisely, while heightened levels of public corruption were found to motivate MNCs to invest through a JV with a local partner rather than a WOS, more pronounced private corruption precipitated the opposite outcome. Our research makes several contributions. First, building on ethics scholarship that has expanded the conceptualization of corruption, we apply an uncertainty-based perspective to examine the effects of both private and public corruption upon the strategic decisions of foreign-investing MNCs. Second, our findings bolster the efforts of theorists who have endeavored to enhance our understanding of the impact of corruption upon the organizational structure of foreign subsidiaries. Third, we contribute new insights which serve to broaden the set of assumptions that can be employed by scholars who develop prescriptions that are intended to narrow design-reality gaps in corporate anti-corruption programs. In doing so, our work responds to George et al. (2016, p. 1887) who urge management researchers to assist in the transformation of “stubborn societal problems into tractable managerial challenges” for which solutions can be devised. In this regard, our research buttresses the efforts of business ethics scholars, policy makers and managers who strive to both curtail MNC engagement in overseas corruption and advance the UN’s sustainable development agenda. The remainder of our paper is organized as follows. In the “Theory and Hypotheses” section, we present some of the literature that has contributed to elaborating the distinction between private and public corruption, in addition to highlighting some of the main tenets of transaction cost theory. Moreover, we review the uncertainty-based perspective that we apply in our work and we present hypotheses with respect to the impact of both private and public corruption upon the organizational structure of foreign subsidiaries. We describe our study’s sample and discuss both the estimation techniques and variable measures in the “Methods” section, followed by the presentation of our empirical findings in the “Results” section. In the “Discussion and Conclusions” section, we summarize our study, highlight its contributions and discuss its potential limitations. To describe the nature of corrupt activities, business ethics scholars have referred to various taxonomies such as market versus parochial corruption (Husted 1994), bureaucratic versus political corruption (Lindgreen 2004), petty versus grand corruption (Argandoña 2005) and low-level versus systemic corruption (dela Rama 2012). Notably, these taxonomies have collectively focused on one type of corruption—government corruption. Consequently, researchers have routinely defined corruption as the abuse of public power for personal gain. While succinct, the narrow conceptualization of the construct has limited study to the domain of bureaucratic activity and restrained what scholars choose to study, model and report (Hodgson and Jiang 2007). Notwithstanding the important insights that have been generated by prior research that has focused on government corruption, business ethicists have continued to advocate in favor of broadening corruption-based research to incorporate a consideration of both public corruption and private corruption (Argandoña 2003, 2017b; Gopinath 2008). As such, other taxonomies such as policy-specific versus widespread or general corruption (Montiel et al. 2012), and procedural versus schematic versus categorical corruption (Aguilera and Vadera 2008) have emerged and challenged scholars to start incorporating a consideration of private sector corruption in their work. In distinguishing private sector corruption from public sector corruption, ethics theorists maintain that private sector corruption involves the abuse of power within private sector (non-governmental) organizations (Argandoña 2003). Gutmann and Lucas (2018) have extended this conceptualization by highlighting four segments of the private sector within which private sector corruption transpires, including businesses, non-governmental organizations (NGOs), religious bodies and the media. Common examples of private sector corruption within business organizations include, among others, commercial bribery, kickbacks, corporate fraud, collusion and insider trading (Green 2013; Kim 2014; Zinnbauer et al. 2009). As other examples, Montiel et al. (2012) observe that some private firms may circumvent the substantial cost associated with implementing various ISO standards which operate as market-based mechanisms designed to signal a firm’s commitment to procedures, policies and practices that contribute to sustainable growth (Aravind and Christmann 2011; Christmann and Taylor 2001). To do so, these private firms may endeavor to obtain certification in some international jurisdictions by paying bribes to private third-party auditors and certifiers which enable the firms to engage in symbolic rather than substantive implementation of standards such as ISO 9000 and ISO 14001 (Christmann and Taylor 2006). Researchers whose work has focused on combatting corruption within NGOs have observed that prevalent forms of abuse of power (or, corruption) within this type of private sector organization include the establishment of “fictitious NGOs” solely for the purpose of generating income for the organization’s executives or Board members, the receipt of kickback payments by NGO employees from prospective vendors with respect to the procurement of goods or services for the organization, and the solicitation of bribes by NGO employees from prospective beneficiaries who seek inclusion on NGO aid distribution lists (The Economist 2017; Trivunovic et al. 2011). Corruption within religious organizations is manifest in the self-interested behavior of a religious organization’s leaders and administrators who extract rents through embezzlement or wasteful spending of the organization’s resources (Gutmann 2015). Finally, corruption in the media occurs when journalists, editors and other media employees solicit or accept bribes in exchange for publishing positive news that is known to be untrue (Spence 2017) or for suppressing the publication of negative or damaging news (Li 2013). To provide a preliminary illustration of the distinction between public and private corruption, we refer to the recent experience of a MNC that was accused of engaging in both types of corruption through its subsidiaries in three foreign markets. The corporation (a provider of automated teller machines (ATMs) used by banks) was alleged to have engaged in public corruption with Indonesian and Chinese public officials who were empowered to influence the ATM-related contract decisions of government-owned banks in those two countries. At the same time, the MNC was also alleged to have engaged in private corruption with employees with similar decision-making powers in privately owned Russian banks (Gorman 2013; Jordan 2016). As another example, a MNC that manufactures tires settled charges pertaining to the alleged payment of bribes by its subsidiaries in Angola and Kenya to the employees of both government-owned entities (i.e., public corruption) and private companies (i.e., private corruption) in exchange for tire sales (Handa 2016; Holtmeier 2015). Business ethics scholars have employed the transaction cost lens to develop theory with respect to the impact of ethics-oriented concerns upon the organizational structure (Luiz and Stewart 2014; Robertson et al. 2010) and strategies of MNCs (Godinez and Liu 2018; Johnsen 2009; Xie et al. 2018). The tenets of transaction cost theory specify distinct types of uncertainty and costs. Environmental uncertainty includes any ambiguity in the operating environment (Karjalainen and Moxham 2013; Montiel et al. 2016) with respect to host government policies, procedures and practices which creates unpredictability for managers (Miller 1992). Information uncertainty is a type of environmental uncertainty that arises when managers’ limited ability to collect and process information about the external environment (Grewatsch and Kleindienst 2017) makes it difficult for them to predict the outcomes of their decisions (Shi et al. 2015). When environmental uncertainty is more pronounced, firms experience greater knowledge-based risk which may impede their ongoing ability to navigate within foreign host market environments (Milliken 1987). Consequently, this need for new knowledge about the external environment precipitates greater information costs (North 1990) which are the costs associated with searching for information that is required to execute transactions in the host market (Madhok 1996). Collectively, environmental uncertainty and knowledge-based risk generally motivate a preference for hybrids over hierarchies (Geyskens et al. 2006), as firms endeavor to leverage a partner’s knowledge and minimize their information costs. Behavioral uncertainty is the uncertainty associated with predicting how others will behave (Krishnan et al. 2006). More pronounced behavioral uncertainty increases the risk of opportunism (Brouthers and Brouthers 2003). Opportunism is “behavior that takes advantage of a chance to deceive or mislead another party” (Smith 2018, p. 612). Partner opportunism is a persistent concern when firms engage in JV relationships (Li 2008). Consequently, an increased risk of opportunism stimulates more pronounced transaction costs, particularly monitoring and enforcement costs (Nooteboom et al. 1997; Romar 2004). While monitoring costs are the costs associated with ensuring that a party fulfills its predetermined obligations (Sampath et al. 2018), enforcement costs include the costs associated with sanctions or exerting control over a party that fails to fulfill its obligations (De Colle et al. 2014). Collectively, behavioral uncertainty and the risk of opportunism motivate firms to prefer vertical integration as they seek to minimize monitoring and enforcement costs (Geyskens et al. 2006). Business ethics scholarship has conceptualized corruption as an institution that fosters uncertainty for foreign-investing MNCs (Luiz and Stewart 2014). Milliken (1990, p. 58) observed that managers “experience several different types of uncertainty as they attempt to adapt an organization to its environment” and, as such, “aggregating uncertainty…may mask significant differences between types of uncertainty.” As such, scholars have advocated in favor of elaborating the principle uncertainties that are precipitated by different institutions in more precarious foreign markets (Ahsan and Musteen 2011; Sartor and Beamish 2014). Drawing a distinction between different uncertainties is important because they underpin firms’ governance choices (Ashill and Jobber 2009). Consistent with this view, Sartor and Beamish (2018) have advanced an uncertainty-based perspective which proposes that different types of corruption can be distinguished on the basis of the disparate uncertainties (environmental uncertainty versus behavioral uncertainty), the unique risks (knowledge-based risk versus opportunism-based risk) and the distinct costs (information search costs versus monitoring and enforcement costs) that they precipitate. More specifically, they propose that some varieties of host market corruption can be expected to primarily inhibit transparency in the foreign market which heightens environmental uncertainty and knowledge-based risk for the MNC. As such, the firm experiences increased information costs as it searches for the knowledge and information that it requires to operate in the foreign market. Conversely, other types of corruption can be expected to primarily inhibit trust in the foreign market and heighten behavioral uncertainty which increases the risk of opportunism and stimulates more pronounced monitoring and enforcement costs for the MNC. In turn, the disparate uncertainties precipitated by the distinct types of corruption are expected to exert different effects on the MNC’s strategic choices. Notably, corruption researchers have identified an important conceptual distinction between public corruption and private corruption which motivates our application of this uncertainty-based framework. More specifically, Montiel et al. (2012, p. 1104) have observed that “government corruption undermines the rule of law and creates uncertainty in the enforcement of regulations…while private sector corruption reduces trust in private institutions and parties…”. Building on the foregoing, Table 1 summarizes how we expect that the differences between public and private corruption will be manifest in foreign markets. First, we focus on the primary impact of each type of corruption upon the host market (either inhibiting transparency or inhibiting trust). Second, we focus on the primary uncertainty (environmental or behavioral), risk (knowledge-based or opportunism-based) and costs (information search or monitoring and enforcement) that are associated with public corruption and private corruption. In turn, more pronounced levels of each type of host market corruption are expected to motivate different preferences with respect to a subsidiary’s organizational structure. While we develop hypotheses with respect to our expectations regarding the distinct effects of public and private corruption upon the organizational structure of foreign subsidiary investments, we acknowledge that other factors such as the characteristics of the parent firm (Brouthers et al. 2003) are also salient determinants. When MNCs enter into a foreign market, they often need to interact with the host market’s public officials to secure goods, services and other resources that are controlled by the state (Wan 2005). Permits, approvals, licenses, utilities, customs clearances, regulatory rulings, tax concessions, judicial decisions and procurement contracts are just a few of the many government-controlled goods and services that may be needed by the MNC to facilitate foreign entry or to sustain ongoing operations in the host market (Rose-Ackerman 1997). Public corruption occurs when government officials and bureaucrats leverage their ability to arbitrarily modify or alter the policies, regulations and procedures that govern the distribution of the state’s goods, services and resources (Lambsdorff 2002b; Luo 2005). Consequently, we assume that public sector corruption inhibits institutional transparency and fosters environmental uncertainty due to the resultant ambiguity with respect to the host government’s policies, regulations and procedures (Miller 1992). In turn, MNCs are exposed to increased knowledge-based risk in foreign markets characterized by heightened environmental uncertainty because public corruption exacerbates information uncertainty for the MNC (Javorcik and Wei 2009). More precisely, foreign-investing MNCs often find that they lack the knowledge and information that is required to navigate their interactions with government officials in more corrupt host market environments (Roy and Oliver 2009). Consequently, information costs will be more pronounced (Luo 2004) as MNCs endeavor to overcome heightened environmental uncertainty and knowledge-based risk in such markets. These “knowledge-based transaction costs” include the cost of identifying new sources of relevant knowledge and information, as well as the cost of absorbing this knowledge (Conner and Prahalad 1996, p. 484). As such, we expect that the relationship between public sector corruption and a foreign subsidiary’s organizational structure will be grounded in a knowledge-enhancement mechanism. A higher perceived level of public corruption in a foreign host market will increase the likelihood that a MNC will structure its foreign subsidiary investment as a JV with a local partner. 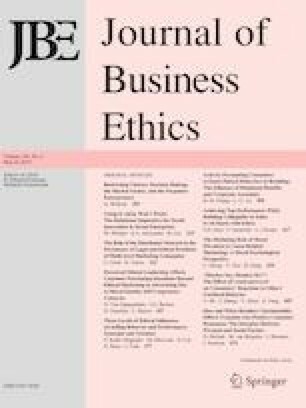 Management scholars and political scientists have observed that private sector corruption impairs societal trust (Montiel et al. 2012; Rothstein 2005). A firm’s value chain is populated by a wide range of private sector stakeholders such as customers, suppliers, investors and employees (Pfarrer et al. 2008). The existence of trust throughout a firm’s value chain confers a degree of confidence that exchange transactions will be executed as agreed upon and expected (Anokhin and Schulze 2009; Jung and Lee 2017). However, the prevalence of private corruption degrades both individual trust and collective trust (Ashforth et al. 2008), as well as undermining “predictability…and…mutually understood standards of behavior for exchange relationships” (Lange 2008, p. 718). Consequently, we assume that higher levels of private sector corruption in foreign countries inhibit trust and foster mistrust within those countries. In turn, MNCs are exposed to heightened behavioral uncertainty (Brouthers and Brouthers 2003; Noorderhaven 1996) and opportunism-based risk (Das and Teng 1996). Monitoring and enforcement costs will be more pronounced (Rose-Ackerman 2010) as MNCs endeavor to overcome the increased behavioral uncertainty and opportunism-based risk that they encounter when the level of private corruption is high. As such, we expect that the relationship between private sector corruption and a foreign subsidiary’s organizational structure will be grounded in an opportunism-reduction mechanism. Intuitively, some might speculate that a foreign-investing MNC will prefer a JV with a local firm in foreign markets characterized by heightened private corruption because a partner could help the MNC to learn how to manage private corruption in the host market. However, we expect that behavioral uncertainty and opportunism-based risk will be a more prominent concern for the MNC here. This is because MNCs engage in innumerable transactions in the private sector when entering an overseas market. Establishing foreign subsidiary operations “requires negotiations with…suppliers, distributors and customers, and a labor force needs to be hired and trained” (Guillén 2002, p. 511). While it is possible that a MNC might encounter private sector monopolies when executing some of these private sector transactions, a host market’s private sector tends to offer a broad array of suppliers, customers, employees and other private sector stakeholders with which the MNC may transact (Calhoun 2002; Meyer 2004). This is very different from the monopolistic conditions that MNCs encounter with respect to the host government’s goods, services and other resources (Shleifer and Vishny 1993). Consequently, we expect that any learning from a potential local JV partner with respect to managing private sector corruption in the host market will be limited by the challenge of bounded reliability (Verbeke and Asmussen 2016). More precisely, the potential learning benefits will be largely idiosyncratic and restricted to a relatively narrow range of private sector counterparties in the host market with which a prospective local JV partner may be familiar through prior commercial transactions. Moreover, a firm’s prior experience in dealing with uncertainty and risk in a foreign market may be as important as a prospective partner’s knowledge. In fact, MNCs routinely rely upon their prior experience to guide their decisions, strategy and behavior under conditions of uncertainty and risk (Jiménez et al. 2018). A higher perceived level of private corruption in a foreign host market will increase the likelihood that a MNC will structure its foreign subsidiary investment as a WOS. Transaction cost theory has traditionally focused upon the governance choice that minimizes opportunism-based transaction costs (Conner and Prahalad 1996; Madhok 1997). However, scholars have advocated the need to integrate established transaction cost tenets with knowledge- and learning-oriented concepts (Rugman and Verbeke 2003). Our disaggregation of the host market corruption construct into its public and private components, in addition to our hypotheses which posit the distinct impact of each upon a foreign subsidiary’s organizational structure, implicitly suggest that an interaction effect between the two types of corruption may influence the foreign entry decisions of MNCs. As Table 1 indicates, the mechanisms that underpin our work are grounded in the distinct uncertainties, risks and costs associated with each type of corruption. Paradox theorists have noted that when a firm engages in decisions with respect to how to structure its operations, contradictory pressures become increasingly salient (Smith and Lewis 2011). The conflicting demands of public and private corruption in the host market complicate a MNC’s efforts to devise its foreign entry strategy and illuminate competing concerns regarding the utility versus the riskiness of a local partner. In practice, we anticipate that a foreign-investing MNC will be particularly focused upon the level of public corruption in the context of its governance choice when planning its foreign entry. We attribute this to the substantial environmental uncertainty and knowledge-based risk that can be precipitated by the bureaucratic exercise of discretionary power and monopolistic control over the government resources that the MNC needs in the foreign host market (Shleifer and Vishny 1993). Public corruption is a consequential complicating factor for MNCs that choose to enter into foreign markets (Javorcik and Wei 2009). The adverse impact of public corruption upon the financial performance (Petrou 2015) and survival (Meschi 2009) of foreign subsidiary investments has been well documented by both academic researchers and the media (The Economist 2010). As such, a compelling imperative exists to motivate the MNC to focus its strategic efforts upon learning how to handle heightened public corruption in foreign markets. To enhance its knowledge base, we have proposed that the MNC will be more likely to invest through a JV with a local partner in such markets. In this context, we expect that “knowledge-based considerations” will “outweigh opportunism-related ones” when the MNC evaluates its governance options (Conner and Prahalad 1996, p. 479). The positive relationship between the level of public corruption and the likelihood that a MNC will structure its foreign subsidiary investment as a JV with a local partner will be weakened by an increase in the level of private corruption. Our sample was constituted by 187 subsidiaries established in 19 foreign markets between 2005 and 2008. The 19 host countries included (the number of subsidiary investments established follows the country name in brackets): France (6), Germany (8), Hong Kong (13), India (20), Italy (1), South Korea (24), Malaysia (4), Mexico (2), Netherlands (11), Philippines (7), Poland (3), Russia (4), Singapore (12), South Africa (1), Taiwan (13), Thailand (23), Turkey (1), United Kingdom (4) and United States (30). The corporate data were obtained from the Kaigai Shinshutsu Kigyou Souran database which reports on the worldwide foreign subsidiary investment activity of Japanese MNCs. Our observations with respect to the dependent variable were lagged by 1 year relative to the observations with respect to our measures of the perceived levels of private corruption and public corruption. We employed Transparency International’s Global Corruption Barometer (GCB) database to constitute our measures of private and public corruption. These data were reported by Transparency International for a period of 4 consecutive years (2004–2007), following which the GCB surveys and the collection of some of the constituent indicators have been executed more intermittently, rather than on a regular annual basis. As such, the availability of this country-level data determined the study period, the host countries and our sample of foreign subsidiary investments. The GCB database reports on the extent to which the general public perceives that various sectors in the country are affected by corruption. The lack of prior research pertaining to private corruption has traditionally been attributed to the shortage of longitudinal data with respect to the level of private corruption in host countries (Rose-Ackerman 2007). However, scholars have recently developed a measure of private corruption that employs the GCB database. Leveraging this data, Gutmann and Lucas (2018) have proposed that the level of private corruption in a country can be measured in terms of the public’s perceptions with respect to the prevalence of corruption in businesses, NGOs, media and religious bodies. Scores range between 1 (not at all corrupt) and 5 (extremely corrupt). We subjected the GCB’s corruption data for these four sectors, along with data for three other sectors reported in the GCB (corruption in the police, political parties and tax revenue) to a principal components analysis with a varimax rotation. Consistent with Gutmann and Lucas’ (2018) conceptualization and measurement of private corruption, businesses (0.765), NGOs (0.773), media (0.857) and religious bodies (0.839) all loaded on one component which we named private corruption. The police (0.963), political parties (0.853) and tax revenue (0.784) all loaded on the second component which we named public corruption. The two components explained 80.05% of the variance in the data and the Cronbach’s alpha for private corruption (0.859) and public corruption (0.908) both exceeded the 0.70 cut-off (Nunnally and Bernstein 1994). The public corruption measure was computed by calculating the average of the three items (police, political parties and tax revenue), while the private corruption measure was calculated by computing the average of the four remaining items (business, NGOs, media and religious bodies). As an example, given that observations with respect to the dependent variable were lagged by 1 year relative to the observations with respect to the perceived levels of corruption, for a subsidiary established in France during 2005, the public corruption measure (3.23) was computed by averaging the results reported by the GCB for France for 2004 with respect to corruption in the police (3.1), political parties (4.1) and tax revenue (2.5). Similarly, averaging the GCB results reported for corruption in businesses (3.5), NGOs (2.5), media (3.5) and religious bodies (2.2) in France yielded the private corruption measure (2.93). We investigate the impact of public and private corruption upon a MNC’s organizational structure (the choice between a WOS and a JV with a local partner). Prior empirical work has employed different equity ownership cut-off conventions to distinguish between a WOS (coded “0” in our study) and a JV with a local partner (coded “1” in our study). We employed the 80, 90, 95 and 100% equity ownership cut-off conventions to distinguish between WOSs and JVs in our sample (Park and Ungson 1997; Yiu and Makino 2002). We report the results of our estimations using the 100% convention in Tables 3 and 4. We present the results using the 80, 90 and 95% conventions as robustness tests in the “Robustness Estimations” section. Using the 80% cut-off, 80.7% of the subsidiary investments were categorized as WOSs and 19.3% as JVs with a local partner. When the 90% equity ownership cut-off convention was employed, 80.2 and 19.8% were categorized as WOSs and JVs with a local partner respectively, while the 95% cut-off yielded a sample in which 78.9% of the subsidiaries were WOSs and 21.1% were JVs with a local partner. Finally, 78.7% were WOSs and 21.3% were JVs with a local partner using the 100% cut-off. Variables were included to control for other effects which have been found to influence a MNC’s decisions with respect to the organizational structure of its foreign subsidiaries. The subsidiary’s relative size was operationalized using a ratio of the subsidiary’s total capital to the MNC’s total assets. The parent MNC’s experience, size and profitability are also important determinants of a MNC’s governance choice for its subsidiary investment (Brouthers et al. 2003). We controlled for the parent’s host market experience using the MNC’s total number of subsidiary years of prior experience in the host market. Parent size was measured using the MNC’s total sales, while profitability was operationalized with the firm’s return on assets. We included a set of dummies to account for the year in which the subsidiary investment was established (Reuer and Ragozzino 2014). A dummy variable was also used to distinguish between service industry and manufacturing industry firms because a firm’s industry designation has also been found to be an important determinant of organizational design decisions (Brouthers and Brouthers 2003). A host market’s economic, institutional and cultural conditions are well-established predictors of a MNC’s organizational structure. We measured host market size using the gross domestic product for each country (Uhlenbruck et al. 2006; Voyer and Beamish 2004). Further, a host market’s economic growth prospects contribute to its environmental risk profile and impact the foreign entry decisions of MNCs (Schwens et al. 2011). We operationalized host market growth rate using the percentage change in real gross domestic product based on national currency in constant prices (Habib and Zurawicki 2002). Foreign direct investment (FDI) restrictions (Gomes-Casseres 1990) was based upon data from the Heritage Foundation’s Economic Freedom Index database. Policy stability was measured using the most recent value prior to foreign entry available from Henisz's (2002) data. Robustness estimations using the risk of political instability indicator data from IMD's World Competitiveness Yearbooks produced substantially similar results in terms of the sign (±) and the significance of the public and private corruption main effects across all of the models. The cultural distance covariate was based upon data from the World Values Survey (WVS) (Chipulu et al. 2018; Ralston et al. 2011). We employed Berry et al.’s (2010) measure which uses the WVS database to compute the cultural distance between countries. Skewed covariates (subsidiary size, host market size, parent MNC size and profitability) were log transformed (Tabachnick and Fidell 2007). Multilevel data structures exist when outcomes at a lower (individual)-level are nested within a higher (group)-level such that the lower-level outcomes are predicted by both lower-level and higher-level independent variables (Liu 2015). Given that the lower-level outcomes occur within higher-level groups, it can be important to allow for the correlations among the observations for lower-level units that belong to the same higher-level group (Rabe-Hesketh and Skrondal 2008). When higher (group)-level information is disaggregated to the lower (individual)-level and all predictors are associated with the lower unit of analysis, researchers overlook the possibility that individuals from the same group may have correlated errors (Luke 2004). As such, multilevel logistic regression models facilitate the efforts of researchers to investigate data structures with variables that span different levels of analysis and to simultaneously estimate relationships between predictors from multiple levels and the binary outcome variable (Liu 2015). Notably, sample size guidelines for multilevel regression models vary (Schoeneberger 2016). Some researchers advocate in favour of the need to employ relatively large sample sizes to execute these models and estimate the effects accurately (Hoffmann et al. 2000; Schoeneberger 2016). However, other scholars maintain that multilevel models can be estimated using unbalanced samples (Peterson et al. 2012) with as few as one to two observations per group (Bell et al. 2008). Given that some of the countries in our sample hosted a smaller number of subsidiary investments relative to other countries in our sample, we report results using multilevel logistic regression (Table 3), as well as ordinary logistic regression (Table 4) as a robustness test (Rabe-Hesketh and Skrondal 2008). In both Tables, Model 1 is a base model which includes all the control variables but excludes the effects of public and private corruption. We then estimated models (Models 2 and 3) which introduce the effects of public corruption and private corruption separately, before presenting Model 4 which includes both main effects together. Hypothesis 3 pertaining to the interaction effect was tested in Model 5 which also includes the main effects of both types of corruption. As such, while Hypothesis 1 with respect to the main effect of public corruption was tested in Models 2, 4 and 5, Hypothesis 2 with respect to the main effect of private corruption was tested in Models 3, 4 and 5. WOS was designated as the reference category in all the models. Table 2 provides descriptive statistics and Table 3 presents the results of the multilevel logistic regression estimations. The highest variance inflation factor (VIF) score (3.79) reported for our models in Table 3 is less than the benchmark value of 10 (Tabachnick and Fidell 2007) and the average VIF across all of our models is 2.04. Further, none of the correlations between the variables in our models exceed the 0.70 threshold (Tabachnick and Fidell 2007). Accordingly, we concluded that multicollinearity was not a concern in our regression estimations. In Table 3, we present the base model which excludes the effects of the two focal corruption variables, along with the models that include the main effects and the interaction effect associated with public and private corruption. Consistent with the expectations posed in Hypothesis 1, the results presented in Model 2 which introduces public corruption alone indicate that this main effect is a significant predictor of a foreign subsidiary’s organizational structure (Model 2: β = 1.31, p < 0.05). The results suggest that higher perceived levels of public corruption increase the likelihood that MNCs will invest through a JV with a local partner, rather than a WOS. Model 3 presents the results when private corruption alone is added to the base model to test Hypothesis 2. The results indicate that the main effect of private corruption is also a significant predictor of a subsidiary’s organizational structure (Model 3: β = − 2.60, p < 0.10). Firms are more likely to employ a WOS investment structure to facilitate entry into foreign host markets characterized by heightened perceived levels of private corruption. To investigate the effects of both types of corruption simultaneously, Model 4 introduces the main effects of both public and private corruption. Consistent with the expectations posed by Hypotheses 1 and 2, more pronounced perceived levels of public corruption continued to predict an increased likelihood that a MNC would invest through a JV with a local partner (Model 4: β = 3.32, p < 0.01). Conversely, higher perceived levels of private corruption precipitated the opposite outcome, namely, an increased likelihood of structuring the foreign subsidiary investment as a WOS (Model 4: β = − 6.74, p < 0.05). Finally, the results associated with Model 5 which tests Hypothesis 3 reveal that the interaction effect between public and private corruption does not have a statistically significant impact upon the structure of a MNC’s foreign subsidiary investments (β = 2.12, p > 0.10). However, the results with respect to the main effects of public (Model 5: β = 3.88, p < 0.05) and private corruption (Model 5: β = − 7.77, p < 0.05) are consistent with the outcomes predicted in Hypotheses 1 and 2. As such, while Hypotheses 1 and 2 are supported by the results presented in Models 2, 3, 4 and 5, Hypothesis 3 is not supported. Taken together, the non-significance of the interaction effect in Model 5, coupled with the significance of the public and private corruption main effects in Models 2, 3, 4 and 5 of Table 3, suggest that public and private corruption do not interact to impact upon the organizational structure of a MNC’s foreign subsidiary investment. Instead, the results reveal that it is the main effects of these conflicting forces that ultimately influence the organizational structure of foreign subsidiaries that are established in more corrupt host markets. The results also reveal that Model 4 exhibits the lowest Akaike information criterion (185.75) (Burnham and Anderson 2004; Liu 2015). To test the robustness of the results reported in Table 3, we executed additional models using the 80, 90 and 95% equity ownership cut-off conventions that have been used in the literature to distinguish between WOSs and JVs (Park and Ungson 1997; Yiu and Makino 2002). Employing these alternate conventions, the results were substantially similar in terms of the sign (±) and the significance of the main effects of public corruption and private corruption across all of the models, with the primary exception being that the main effect of private corruption became significant at the p < 0.01 level in Model 4 when the 80% cut-off convention was used. We also investigated the possibility that two of the sectors that are incorporated into the measure of private corruption (media and religious bodies) may not be purely private sector entities in some of the 19 countries that we study. To do so, we leveraged prior cross-country research pertaining to government involvement in religious organizations and media organizations (Barro and McCleary 2005; Djankov et al. 2003). We determined that some of the subsidiary investments in our sample were established in a country with a state religion during our study period (i.e., Protestantism in the United Kingdom; Catholicism in Italy; Buddhism in Thailand, etc.) (Barro and McCleary 2005) and some were established in a country within which the top five daily newspapers were not owned entirely by private sector individuals and entities (Djankov et al. 2003). Therefore, as a robustness check on our results, we re-executed each of the models reported in Table 3 using a two-item measure of private sector corruption which was constituted by the indicators of corruption pertaining to businesses and NGOs (and excluded the items pertaining to the media and religious bodies). Employing the two-item measure of private sector corruption, the results were substantially similar in terms of the sign (±) and the significance of the main effects of public corruption and private corruption across all of the models, with the primary exception being that the main effect of public corruption became significant at the p < 0.01 level in Model 5. As discussed in the “Estimation Methods” section, we also tested whether our results were robust to an alternate regression method. Table 4 presents the results of the ordinary logistic regression models that were estimated as a robustness check on the multilevel logistic regression results that are reported in Table 3. As Table 4 indicates, the results were substantially similar to the results reported in Table 3 in terms of the sign (±) and the significance of the main effects of public corruption and private corruption across all of the models. The primary exception to this is that the main effect of private corruption became significant at the p < 0.01 level in Model 4. Further, some of the covariates (such as parent MNC host market experience and FDI restrictions) that were not significant in the multilevel models that are reported in Table 3 became significant in some of the binary logistic regression models reported in Table 4. Finally, given the non-linear nature of logistic regression, the coefficients can be more challenging to interpret (Tabachnick and Fidell 2007). As such, we also assessed the substantive or practical significance of our results by calculating the predicted probabilities (Long and Freese 2014) of a MNC from our sample investing through a JV with a local partner at different perceived levels of private corruption and public corruption. We hypothesized a positive relationship between the perceived level of private corruption and the likelihood of a WOS (or conversely, a negative relationship between the perceived level of private corruption and the likelihood of a JV with a local partner). The results of the regression estimations supported this hypothesis. Consistent with this finding, the predicted probability of a MNC in our sample establishing a JV with a local partner at a perceived level of private corruption one standard deviation below the mean of private corruption was 43.9%, whereas it was 10.9% at a perceived level of private corruption one standard deviation above the mean. We also hypothesized a positive relationship between the perceived level of public corruption and the likelihood of a JV with a local partner. Again, the results supported this hypothesis. Consistent with this finding, the predicted probability of a MNC from our sample establishing a JV with a local partner at a perceived level of public corruption one standard deviation below the mean of public corruption was 8.8%, whereas it increased to 39.4% at a perceived level of public corruption one standard deviation above the mean. Both the UN’s Global Compact and its SDGs implore stakeholders to work against all forms of corruption. Despite the urgency of this objective, corruption has persisted as an unrelenting global challenge that has been implicated as the root cause of numerous social and economic maladies. For example, economists have established that countries with high levels of corruption suffer from higher levels of poverty and income inequality because corruption reduces the resources available to fund public services such as education and healthcare (Gupta et al. 2002; Rose-Ackerman and Palifka 2016). Given that the International Monetary Fund (IMF) has recently estimated that the annual cost of bribery now amounts to approximately 2% of global gross domestic product (IMF 2016), a compelling imperative continues to motivate scholars’ efforts to deepen our comprehension with respect to the nature of foreign host market corruption and its impact on the strategic and structural decisions of MNCs, in order to contribute to efforts to curb MNC engagement in foreign market corruption. As such, our research has asked: How do the perceived levels of public sector (government) corruption and private sector (non-government) corruption impact upon the organizational structure of a MNC’s foreign subsidiaries? Our research makes several contributions. First, building on ethics scholarship that has broadened the conceptualization of corruption (Argandoña 2003, 2017b; Gopinath 2008), we have examined the effects of both private and public corruption upon the strategic decisions of foreign-investing MNCs. Given that corruption taxonomies have primarily focused on public corruption, the narrow conceptualization of the construct has traditionally constrained the scope of research inquiry to the domain of bureaucratic activity. However, practical concerns are motivating the need to enhance our understanding of the private corruption construct. More specifically, achieving the targets established for the UN’s SDGs is predicated upon the existence of sustained global economic growth (United Nations 2015). However, private corruption has been associated with both substantial declines in equity markets worldwide and subsequent global economic contractions on two separate occasions during the first decade of the twenty-first century (Ashforth et al. 2008; Tridico 2012; Weismann 2009). Equally-troubling, scholars have argued that private corruption engenders a wide range of adverse organizational consequences including, among others, lost revenues (Vadera et al. 2009), inefficient resource allocation (Green 2013) and the deterrence of capability-building (Luo 2005). In addition to amplifying the negative social, political and distributional effects of public corruption (Gopinath 2008), scholars have also proposed that private corruption may undermine shareholder value both indirectly, as a consequence of fines and penalties (Bishara and Schipani 2009), and directly through the depreciation of a firm’s market capitalization (Narayanan et al. 2007). Our desire to focus more attention on private corruption may help to inform the development of managerial strategies that can be implemented to alleviate the adverse organizational effects of private corruption (Lambsdorff and Schulze 2015). Ultimately, “an understanding of private corruption is vital to any assessment of the role of business in society and of the effects of firms on the environment of corruption” (Rodriguez et al. 2006, p. 739). We have contributed to this research agenda by applying an uncertainty-based perspective that is grounded in transaction cost theory (Sartor and Beamish 2018) to detail the different mechanisms through which public and private corruption can be expected to influence the organizational structure of foreign subsidiaries. We proposed that when MNCs encounter more pronounced corruption in foreign markets, public and private corruption can each be expected to exert distinct effects. Hypotheses were tested using a new measure of private sector corruption developed by Gutmann and Lucas (2018). We found that whereas more pronounced perceived levels of public corruption in foreign host countries motivated MNCs to prefer JVs with a local partner (rather than WOSs), heightened perceived levels of private sector corruption prompted MNCs to structure their foreign subsidiaries as WOSs. We attribute these distinct strategic responses to the different uncertainties and risks that underpin the relationship between the perceived level of each type of host market corruption and the organizational structure of an MNC’s foreign subsidiary investment. More specifically, in the case of public corruption, environmental uncertainty and knowledge-based risk are the primary uncertainty and risk that influence the MNC’s structural decision. Conversely, in the case of private corruption, behavioral uncertainty and opportunism-based risk predominate in shaping the MNC’s preference. Our empirical findings and efforts to disaggregate host market corruption into both public and private corruption collectively help to clarify and improve our theoretical comprehension of the relationship between the perceived level of host market corruption and the organizational design decisions of foreign-investing MNCs. Third, our research has built on the recent work of business ethics scholars who have become more focused upon enhancing our understanding of the various types of corruption that firms encounter in foreign markets (Luiz and Stewart 2014; Van Vu et al. 2018), as well as the different strategic, structural and operational responses of MNCs to heightened levels of corruption (Godinez and Liu 2018; Orudzheva et al. 2018; Xie et al. 2018). In doing so, we extend the body of business ethics scholarship (Clark and Brown 2015; Gago-Rodríguez et al. 2018; Gorsira et al. 2018; Hauser 2018; Remišová et al. 2018) that is generating theory to help inform the efforts of scholars who endeavor to design better corporate anti-corruption strategies and curb MNC engagement in overseas corruption. More specifically, our work contributes new insights which serve to broaden the set of assumptions that can be employed by anti-corruption researchers. Transaction cost-based anti-corruption research conceptualizes corrupt acts as exchanges (Aidt 2003). Scholars have theorized that increasing the costs associated with engaging in these exchanges should reduce their prevalence (Bray 2005). As such, transaction cost researchers have identified a range of theoretically grounded strategies that should increase the costs associated with engaging in corruption. These include strategies designed to enhance monitoring, destabilize corrupt agreements and encourage betrayal among corrupt actors (Lambsdorff et al. 2005). However, assessments with respect to the efficacy of these transaction cost-grounded strategies in reducing the prevalence of MNC engagement in foreign market corruption have been mixed (Lambsdorff 2007; Rousso and Steves 2006). Heeks and Mathisen (2012) propose that the limited effectiveness of anti-corruption initiatives can be a consequence of design-reality gaps whereby theoretical assumptions embedded within the design of anti-corruption programs fail to accurately reflect the reality of the contexts within which these initiatives are deployed. We noted that two key assumptions have frequently underpinned the strategies and policy recommendations of anti-corruption theorists. First, corruption is conceptualized as occurring primarily within a MNC’s public sector transactions with government officials and bureaucrats (Goel et al. 2015). Second, engaging a “middleperson” such as a JV partner is assumed to be a key strategy employed by MNCs to manage both the transactional uncertainty precipitated by more pronounced government corruption and the heightened transaction costs instigated by global anti-corruption efforts (Bray 2005; Drugov et al. 2014). However, these assumptions constitute important sources of potential misalignment between the design of an anti-corruption program and the context within which the program is deployed (Hansen 2011; Persson et al. 2013). Our conceptual work and research findings suggest that policy prescriptions designed to curb MNC engagement in overseas corruption must consider both the multidimensional nature of the construct and the distinct strategic responses of MNCs to different types of corruption to ensure that anti-corruption programs are properly calibrated. As such, the insights that emanate from our work contribute to the ethics-based anti-corruption research agenda which has advocated in favor of “subscribing to a wider view of the definition of corruption” and developing “a more comprehensive understanding of how corruption impacts business” (Bishara and Schipani 2009, p. 766). Given the global pervasiveness of both private and public corruption, some researchers have recognized the importance of deterring both types of corruption (Goel et al. 2015; Rose-Ackerman 2010; Weismann et al. 2014). Our findings that public and private corruption each exert a distinct impact upon the structural decisions and partnering choices of MNCs suggest the need for increasingly multifaceted anti-corruption and corporate governance initiatives. In doing so, we bolster efforts to reduce the prevalence of design-reality gaps that threaten to undermine the efficacy of anti-corruption programs. In turn, our work serves to enhance the potential for scholars, policy makers and managers to curtail MNC engagement in overseas corruption. Further, improving our understanding of how MNCs respond to distinct types of corruption in foreign markets is ultimately intertwined with ongoing efforts to foster more responsible MNC leaders (Siegel 2014) whose actions can make a positive contribution to the achievement of the UN’s full suite of sustainable development objectives. Notwithstanding our contributions, some limitations do exist. A first limitation is the use of a sample of firms from a single home country. While scholars have argued that this approach can be beneficial because it minimizes the impact of differences between multiple home countries upon the dependent variable (Coeurderoy and Murray 2008), future research should consider opportunities to verify our results with a sample of non-Japanese MNCs. Second, while our study is one of the first to employ the new measure of private corruption that has been developed by Gutmann and Lucas (2018), the geographic and temporal coverage of the measure’s underlying data is still limited. As one example, private corruption data for our study period was not available for several countries including China, notwithstanding China’s prominence as a global destination for FDI (World Investment Report 2017). Moreover, after 2007, the GCB surveys have been executed more intermittently, rather than on a regular annual basis. Despite these limitations, the patterns that emerge from our research open new avenues for future scholarship. Different types of corruption have been found to exert distinct impacts upon the structure of a MNC’s foreign subsidiaries. To extend our work, researchers should explore the effects of public and private corruption upon other decisions facing the MNC such as its expatriate assignment and asset deployment strategies. Additionally, the corporate social performance implications associated with adopting different organizational structures in more corrupt host market environments should also be investigated, with particular attention being given to the contingent effects associated with the distinct components of corruption that we have studied. Each of these lines of research inquiry holds the potential to augment the efforts of anti-corruption researchers, policy makers, MNCs and managers to address the pernicious challenge of overseas corruption.